(Bloomberg) -- Stocks fell the most in almost three weeks as rising pessimism that trade tensions with China will persist helped send technology and multinational companies tumbling. Treasuries climbed, oil fell and the yen strengthened. Chipmakers plunged more than 3 percent, with every member of the Philadelphia Semiconductor Index in the red. Caterpillar and DowDuPont led declines in the Dow Jones Industrial Average of more than 400 points at one point. The S&P 500 briefly pared losses after presidential adviser Lawrence Kudlow said a Financial Times report that the U.S. canceled a preliminary meeting with Chinese officials was untrue. After the close of U.S. trading, Senate Majority Leader Mitch McConnell scheduled a vote for Thursday on Democratic-backed legislation to reopen the government, the first sign of a possible way out of the shutdown. IBM also reported results that topped analyst estimates. sending the company’s shares up in after-hours trading. The Stoxx Europe 600 Index dipped after Switzerland’s UBS Group AG delivered disappointing results. Earlier, shares retreated across Asia after Chinese President Xi Jinping stressed the need to maintain political stability, comments which hinted at growing concern over the country’s slowing economy. 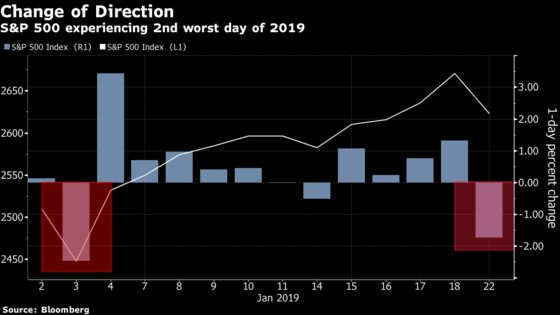 After stocks and many risk assets kicked off the year with a stellar rally, investors now find their conviction tested anew as a familiar litany of concerns weigh on sentiment. The IMF’s dour forecast for global growth, fears of slowing momentum in the world’s second-largest economy and uncertainty over trade are all combining to spook markets. Elsewhere, the pound rose after U.K. data showed the jobs market remains resilient and as Labour leader Jeremy Corbyn backed a plan that could open the door to a second Brexit referendum. Oil retreated from a near two-month high in New York. At the World Economic Forum in Davos, billionaire investor Ray Dalio chastised monetary policy makers for an “inappropriate desire” to tighten faster than the capital markets could handle. There are monetary-policy decisions for the Bank of Japan (Wednesday), the Bank of Korea and the European Central Bank (both Thursday). The S&P 500 Index fell 1.4 percent to 2,633 as of 4:02 p.m. New York time, while Nasdaq Composite Index tumbled 1.9 percent to 7,020 and the Dow Jones Industrial Average declined 1.2 percent to 24,405. The Stoxx Europe 600 Index declined 0.4 percent, the largest drop in a week. The U.K.’s FTSE 100 Index dipped 1 percent. Germany’s DAX Index declined 0.4 percent. The MSCI Emerging Market Index declined 0.9 percent, the largest drop in more than two weeks. The Bloomberg Dollar Spot Index rose less than 0.1 percent, the sixth consecutive gain. The euro was little changed at $1.1360. TheBritish pound increased 0.5 percent to $1.2960. The Japanese yen gained 0.3 percent to 109.30 per dollar, the biggest rise in more than a week. The yield on 10-year Treasuries sank five basis points to 2.74 percent, the largest decline in more than a week. Germany’s 10-year yield fell two basis points to 0.23 percent, the biggest fall in a week. Britain’s 10-year yield rose than one basis point to 1.32 percent. West Texas Intermediate crude declined 2.3 percent to $52.57 a barrel, the largest drop in more than a week. Gold rose 0.7 percent to $1,285 an ounce.